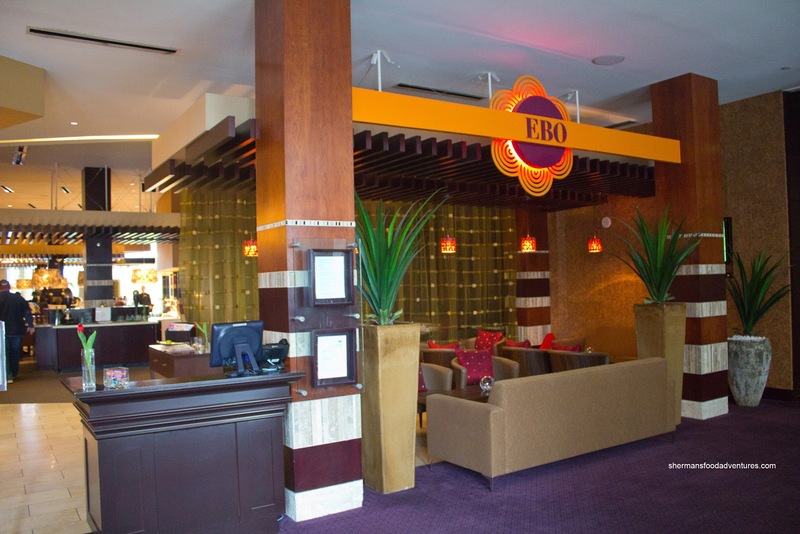 Last year, I lobbied long and hard for EBO to be the location of Viv's staff party. After all, the place is spacious, nicely appointed and serves great food. We got as far as the inquiring about the menu and prices, but alas, it was decided the place was too pricey. Ultimately the party ended up at Baci out on Hastings. For $45.00, we were served "okay" food, but nothing that would remotely compare to what EBO is capable of. Yes, I left with a bad taste in my mouth... Fast forward to 2012 and once again, I threw it out there... EBO! They were able to secure similar pricing to Baci (actually even better) for a 3-course meal and voila, the Christmas party was going to be at EBO! Finally. A Christmas party I was actually looking forward to! Even before our actual meal and right after the bread (which was fantastic), we were presented with an Antipasto Plate consisting of pate, Serrano ham, olives and gherkins. Nothing particularly amiss with the plate as we proceeded to gobble it all up pretty quickly. 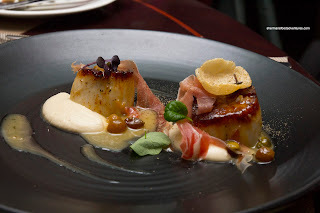 For my appetizer, I started with the Roast Scallops with vanilla scented cauliflower puree, prosciutto, scallop chip, capers and sultana raisins. The scallops were large and cooked beautifully. They were naturally sweet and accented nicely by the salty prosciutto and aromatic cauliflower puree. The sweet raisin reduction added another layer of sweetness. For my main, I went for the Roast BC Salmon with pomme puree, seasonal vegetable sauté, salmon chip and lobster emulsion. The salmon was just barely cooked which ensured a moist texture and flakiness. The puree was aggressively seasoned which worked in this case since the salmon was quite mild. The star of the show was the lobster emulsion which really kicked up the flavours. 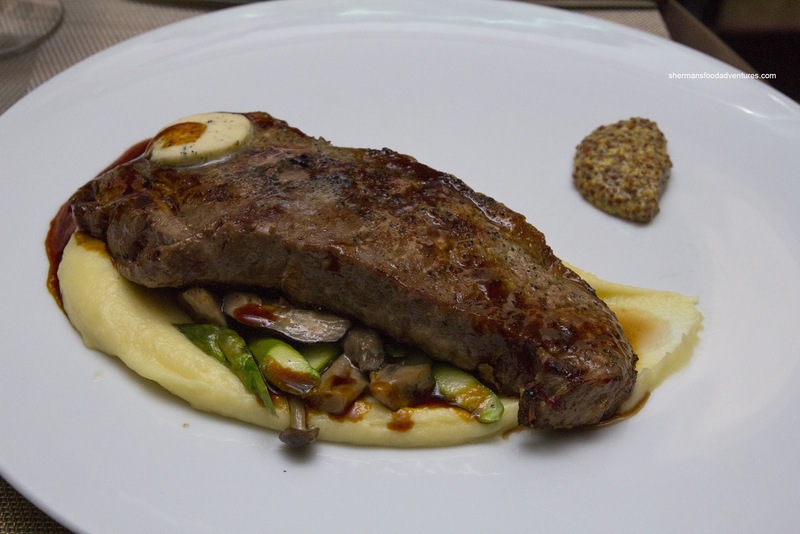 Viv went for the other choice of entree being the 8oz Beef Strip Loin with sautéed mushrooms, asparagus, pomme puree and red wine jus The steak was sufficiently tender where it sat on a smooth puree, mushrooms and asparagus. Although seemingly simple on paper and visually-speaking, the dish was composed and well-prepared. 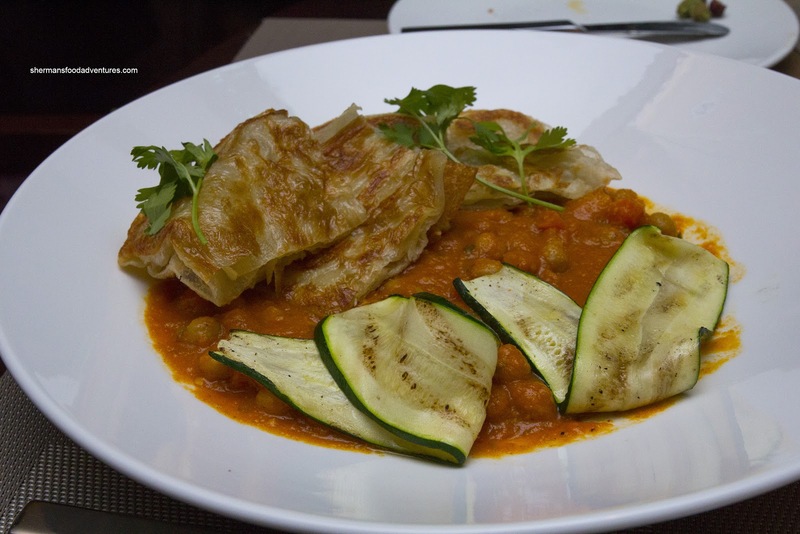 As for the vegetarian option, it came in the form of a Chickpea Stew accompanied by EBO's ever-popular house-made Roti. The stew had developed flavours, in particular sweet onion. The flavours were mild, yet still apparent. With the plethora of chickpeas, the dish had a decent amount of body. Of course the roti was good being flaky and crispy with a bite in the middle. Lastly, for dessert, I had the NY Cheesecake with mixed berry compote. I liked the cheesecake as it was very cheesy. The texture was smooth and it was not overly sweet. The crumb crust was just right. 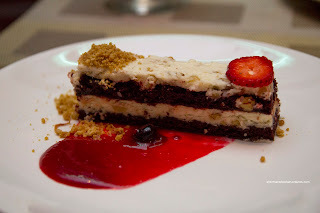 Viv had the other dessert option being the Red Velvet Cake with walnut streusel and raspberry puree. The red velvet cake could've been more moist as it came up a bit dry. The flavours were there though and the coulis helped alleviate the dryness a bit. After it was all said and done, I was pleased with the Christmas party. It was one of those rare times the food was actually restaurant quality, rather than glorified catering. More often than not, some of the past venues were chosen for convenience over anything else. 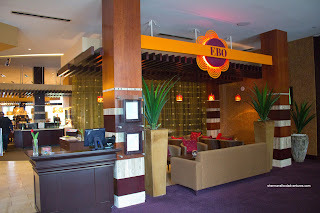 But with the combination of good food, attentive service and swank decor adjacent to a casino and lounge, what's there not to like? Wow - all that for $45 per person?!? Chef Craig is a miracle worker! I've sadly not been there yet - I need to correct that soon.